100 Years Of Bollywood are completed. Here I'm going to write about some great movies. 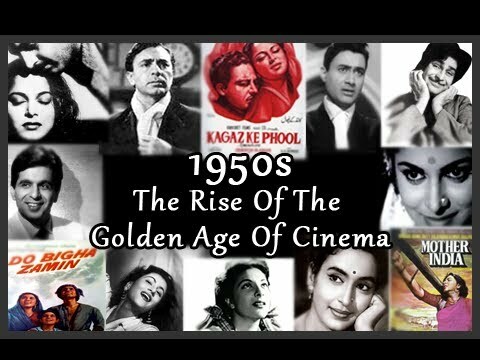 1950s was the decade that saw the rise of the golden age in the world of Bollywood cinema. It was a time that saw few great Hindi movies of all time like Pyaasa, Awaara, Kaagaz Ke Phool, Anari, Shree 420, Baiju Bawra, Mother India, Do Bigha Zameen, Devdas, Howrah Bridge, Chori Chori, Naya Daur, Do Aankhen Barah Haath, Sujata etc. It saw the insurgence of parallel cinema and also gave the industry one of the most loved and memorable actors like Raj Kapoor, Dev Anand, Guru Dutt, Dilip Kumar, Madhubala, Nargis, Meena Kumari, Waheeda Rehman etc.